This is several different kinds of crazy. First, Stewart repeats his belief that Ryan’s plan would increase taxes on investment income. But that belief has no basis other than Stewart’s own belief that it would be a good idea. As I pointed out before, Ryan’s own budget argues against raising taxes on capital gains and dividends. The only thing Stewart can find is Ryan’s apple-pie platitudes about the need for tax reform. But Ryan’s own vision of tax reform, as evidenced by his budget’s own words, doesn’t include higher capital gains taxes. (In addition, as a signatory to the Taxpayer Protection Pledge, Ryan is sworn to “oppose any and all efforts to increase the marginal income tax rate for individuals and business.” That sounds to me like it includes the capital gains tax rate, which is a marginal income rate.) This is further evidence of columnists’ ability to project their own fantasies onto Paul Ryan’s handsome face. More generally, Stewart pins high hopes on Ryan’s embrace of tax reform. But all Ryan’s budget actually says about tax reform can be summed up in two points: tax reform is good; and tax rates should be lower (25 percent for the top individual rate and for the top corporate rate, both down from 35 percent today). This of course allows credulous people to see themselves in Paul’s blue eyes (see above). But if you want a serious starting point for tax reform, you should look at Simpson-Bowles or Domenici-Rivlin, both of which spelled out actual tax expenditures they would close (or Feldstein, Feenberg, and MacGuineas, or White House Burning, or any one of many other policy proposals that do the same). Ryan’s “tax reform” is nothing more than a few talking points designed to score political points (why else would you specify the lower tax rates but not the closed loopholes), not a starting point for anything. Stewart also plays the “centrist” card with unprecedented aggressiveness. He cites attacks by the Club for Growth as proof of Ryan’s reasonableness. But when it comes to military spending, the Club for Growth isn’t attacking Ryan from the right; it’s attacking him from the left. Democrats want to reduce military spending as a share of GDP; so does every bipartisan deficit reduction panel; so does the Club for Growth (which thinks that the automatic spending cuts in the Budget Control Act should be respected). Ryan, by undoing the automatic spending cuts to preserve defense spending, is to the right of the budget debate, not in the center. In other words, everyone knows that if you want to reduce the deficit you have to cut defense spending—except Paul Ryan and James Stewart. Then there’s Medicare, one of the few areas where Ryan is willing to spell out his cost-cutting proposals. For Stewart, this shows that Ryan is a brave warrior against entitlement spending. 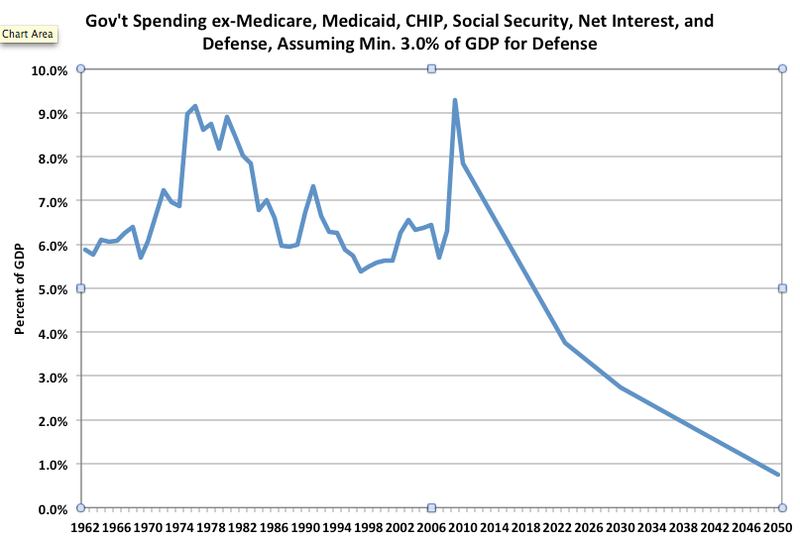 But simply tackling entitlement spending doesn’t make you reasonable, centrist, or worth listening to; everyone who talks about the deficit talks about tackling entitlement spending. (Even Simon and I do, although our entitlement cuts are smaller than most other people’s.) It’s the actual proposal that matters. And Ryan’s proposal is only one step from the far-right fringe—that’s the step he walked back since last year. Last year he was going to convert Medicare into a voucher program where you could use your voucher toward insurance from a private company, but the value of the voucher was artificially capped so it would buy less and less health care over time. This year the only difference is that now you can buy insurance from a private company or from traditional Medicare. But in either case, the important points are: (a) the vouchers are designed to grow more slowly than the cost of health care, meaning a huge transfer of cost and risk from the government to individuals; and (b) reliance on the private market to reduce costs and improve outcomes (something it’s failed at dismally for the last forty years). Having a Medicare plan shouldn’t win you any points; it’s what’s in the plan that matters. At least for most of us. This inattention to actual policy is how Stewart can think that “within the Ryan budget proposal is the outline of a grand compromise not all that different from the one President Obama and the House majority leader, John Boehner, reportedly came close to reaching last summer: long-term deficit reduction through tax reform, higher tax revenue and spending cuts.” Well, yes, if you’re going to stick to the level of abstract generalities, I guess the Ryan budget is similar to the Obama-Boehner deal in that both included tax reform and spending cuts. In practice, though, the Obama-Boehner deal was nothing like the Ryan budget. We know the tax reform was completely different because Boehner was offering higher tax revenues that were not entirely due to supply-side fantasies. Ryan only achieves higher tax revenues by dictating that his plan will bring in 19 percent of GDP in tax revenue; nowhere does he say how we would actually achieve this while slashing tax rates. We also know the spending cuts were completely different, because Obama-Boehner did not convert Medicare to a voucher system (they did include spending cuts, but they kept the same benefit structure), while Ryan does. This picture shows all government spending except for Medicare, Medicaid, CHIP, Social Security, and net interest. (The data are from Tables 1.1, 1.2, 3.1, and 8.5 of the OMB’s 2012 budget, historical tables.) It’s a close approximation for discretionary spending, and it’s what the CBO uses in its long-term projections. 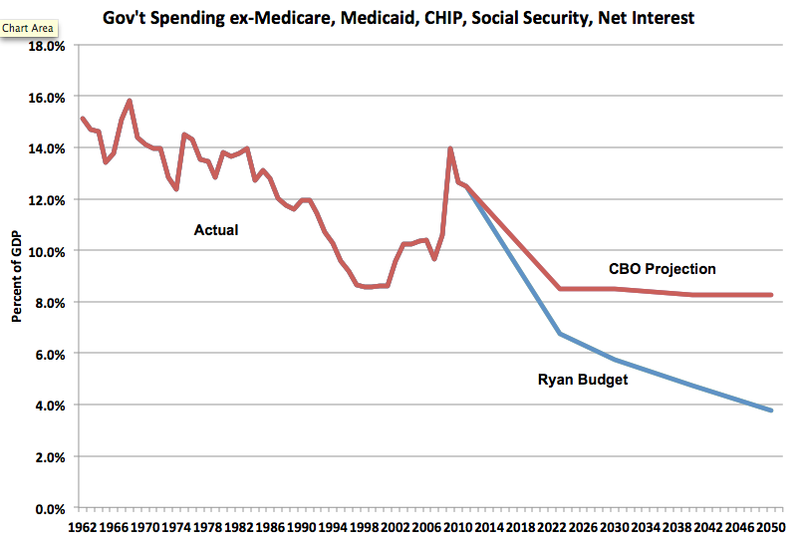 The Ryan Budget would reduce spending on everything except Social Security and health care to the lowest levels since before the Great Depression. This is a blatant assault on the entire federal government except for health care, Social Security, and defense. This is not a courageous, centrist starting point for a real deficit solution. This entry was posted in Commentary and tagged budget deficit, Paul Ryan. Bookmark the permalink. Just pass the budget now so we can find out what’s in it later. I would feel a lot better knowing Nancy is on board. Hows bout you ins? I just read a piece by David Brooks in the New York Times and he also comes off as a Paul Ryan fan. But to understand Paul Ryan, you need to understand that he went to work for the government in Washington right out of college and he has never had any other job. In his current job, he has gold plated health insurance, a gold plated retirement scheme, and a healthy wage. As is often true, I agree with 98% of what Mr. Kwak writes above. And I also like James W. Taylor’s comment very much. Taylor’s comment gets to something that really sticks in my craw. That is, why none of these “journalists” ever ask Republican congressmen why federally supplied health care is such a great idea for them and a bad idea for everyone else?? Why is federally supplied/paid health care efficient/cost-effective for Republican Senators, but inefficient/cost exorbitant for everyone else?? Chuck Grassley showed your typical Republican’s attitude/viewpoint on this question clearly. I want to know why and how Paul Ryan and Eric Cantor never get asked this question by our current crop of “journalists”?? How come we can get a gentleman from Iowa who has the “chutzpa” (is it “chutzpa” or just a damned fair question?) to ask this question, but not 1 single Sunday morning political talk host to ask this question?? I might also add in closing, that Republican Senator Tom Coburn, a man constantly reminding us he is a “Doctor” (his specialty is obstetrics) has never as far as I know refused his federally supplied health care plan. Maybe he “forgot” to tell us he refused his federally supplied health care plan because he is still aggravated he hasn’t been nominated for sainthood for giving treatment to 2 or 3 Medicare patients at last count (a high percentage of doctors refuse to see Medicare patients, because Medicare often only pays what they think the services are worth). Or maybe, more likely, Republican Tom Coburn doesn’t want Americans to know what a huge hypocrite he is for happily grabbing/receiving federally supplied health care, while spending half his time bad-mouthing its costs. 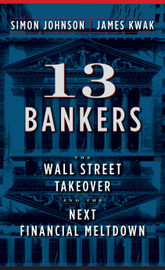 James Stewart has written few insightful articles since he wrote about Drexel and Milken. He just doesn’t get it. The Ryan budget returns us to the New Deal (if not Gilded Age) era, and the next item on the agenda to to repeal is Social Security. Ryan is a charlatan and an agent for the Koch brothers and their interests. It doesn’t take more than a minimum of intelligence to see what Ryan and his ilk are up to. If Stewart doesn’t get it it’s because he doesn’t want to, or worse. Let’s bang on the issues, not the apologists. The issues are too important to focus on the personalities. If Stewart’s views prevail, they’ll come for him soon after the hard Right prevails. “Doctor” Coburn, on the small chance you are out there reading this, this little audio tool from Macmillan Dictionary might be highly useful to you, so you don’t embarrass your constituents as often in the future. Just click the little button that says pronunciation after the link jump. @Moses Herzog: They work for the federal government, which is why they have a federal government health plan. If a person works for Microsoft, or Apple, or Safeway, they get the plans of those companies. Does that stick in your craw too? James, you had me at “this is several different kinds of crazy” because so much of what we hear from the media is just that. Whether it’s Paul Ryan or the like, there is so much crazy to choose from and a lot of people siding with one side of crazy or the other. And I wonder how much of the crazy is created by design to distract us from the bigger issues concerning our future. By staying in touch with Baseline Scenario I feel much more grounded and aware of the realities we face in this nation and I’ve learned that ignorance and passivity are not an option. I applaud you and Simon for your work educating me and the rest of America on how our legislative, executive and judicial system work and how reform can only happen when facts are spoken (and understood) louder than fiction. Today’s life is a fluff sandwich with some law and politics on the side. Or, 3 peas in a pod. That’s a point that bears repeating. Ryan isn’t in the center of the budget debate. He’s to the right of the extreme right. Also I think you’re being generous in only assuming Ryan would not raise taxes on interest, capital gains and dividends. In his Roadmap Plan 2.0 he explicitly states he would eliminate taxes on interest, capital gains, dividends and the estate tax. This implies that the mysterious “loopholes” he would close are precisely those exclusions, deductions and credits that benefit the middle class. Under Ryan’s plan Mitt Romney would see his effective tax rate fall from 14% to 0% and Tax Policy Center analysis implies that the middle quintile would see its average effective tax rate rise from 12.5% to 19.5%. @Moses Herzog: I admit I am unfamiliar with the “Coburn controversy” that has you so annoyed, but it did occur to me that the fact that he only had 2 or 3 Medicare patients over his career is probably because he’s an obstetrician. Not too many pregnant women over 65. Assuming he does some gynecology, that may account for the handful Medicare patients you say he has had — women typically stop seeing a gynecologist before Medicare age, but not 100% of the time. Medicare utilization is pretty low for OB/GYNs as a result. Also, I agree with maynardGkeynes that it’s a little strange to expect representatives to go without employer-supplied health insurance because they disagree with type of plan available to them or find it too costly. Kind of like Obama tapping SuperPAC money — disagreement doesn’t necessitate shooting yourself in the foot. As regards your first point on Coburn seeing few Medicare patients due to his chosen specialty of obstetrics, you make a very valid point. I don’t know what the numbers are but my guess is you are correct. And it does put quite the wrecking ball to that particular point (I’m going to give you that one, raising the white flag). Nonetheless, I can’t help but think that a man of as low character as Tom Coburn (and I see him as such), it wouldn’t matter what specialty he has chosen, including “general practitioner”, I doubt that he would have made the effort to see many Medicare, low-income patients, and I even suspect he would have refused them. Now maybe that is an extreme unfair judgement on my part, as it is only based on my subjective opinions of Coburn, and not fact. I still hold to that opinion though. Your second dissection, regarding my argument against Pres. Obama taking “special interest” money (in a prior Baseline post I believe?? ), is also a valid point. But I think my argument still stands and stands quite strongly. Firstly, Pres Obama made a promise. No one held a gun to Pres Obama’s head forcing him to make that verbal promise. A promise which was not based conditionally on his political survival. But a personal promise to the American people (similar I might point out to the senior George Bush’s pledge of “Read my lips, no new taxes”). This alone should preclude him from taking the monstrous amount of money he has taken from “special interests”, including money from oligopolist big banks. I would argue also that if you think that something is morally/ethically wrong and could poison your decisions as Chief Executive, a person might occasionally stand on principle alone, no matter how the cards fell. Here is the thing, you see that government is strongly involved in the Senators’ and congressmen’s health care plan, including a very generous copayment and broad selection of multiple companies which unless you were working for a big Fortune 500, you would be very very unlikely to get. Do we see any “death panels” for Senators or Congressman on a federally provided health care plan now?? It’s very laughable. “Senator Chuck Grassley gets a pretty sweet deal as Senator on health care. He pays $356.59 per month, and the most he pays when visiting a doctor or hospital is $300. Compare that to your average Iowan family, who would pay almost $600 a month and be on the hook for $5,000 or more if they went to the hospital. I don’t get it. Do these people really think that by killing the goose that lays their golden eggs, they will be richer? Do they really think, if they have all the marbles, people will still want to play with them? They have everything they could want, and they still want more. There’s only two things I can figure out that they might still want: Other people’s misery, and slaves. Somebody help me with this. What else can they want? To be reined in? To be forced to serve some master, perhaps? In that case also, appeasing them or compromising with them fails. Paul Ryan is pushing a dangerous and radically-nihilitistic scheme that would effectively ruin the central government, and by extension, all the people who depend on it, which is nearly all of us. Any writer seeing positive benefits from this type of proposal is not apprehending the evil-underpinnings of such wrong-headed ideas. I recall something from my 11th grade US history course called “tarred and feathering”……….eminently suitable for those deliberately seeking the ruination of the United States government, imo. Ryan’s Budget = Fantasy Revenues. Then what do we do bring back The Government Cheese? But I do consider this mock return seen over at FIREDOGLAKE today as approximately the specificity and duplicity of the Ryan blather. check it out, it’s funny. I prefer don’t call me, i’ll call you. Paul Ryan has not gotten over reading his teengage “Atlas” fantasy fiction and is attempting to one up his favorite fantasy author Ayn.